When you read a lot of a particular author, there are favorite characters who begin to appeal to you, and make you want to read more of. 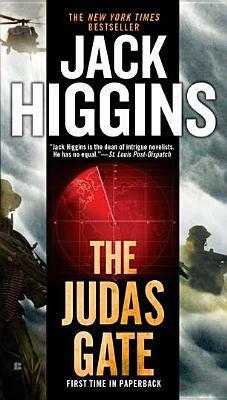 In this category is Jack Higgins' hero Sean Dillon. I have read quite a few Sean Dillon thrillers, and felt them to be quite good. When I picked up The Judas Gate, I expected it to be quite good too. Plot-wise, I think this one's not the best of Higgins, because it starts out with just a recording of the villain expressing something, and the chase based on that. It didn't seem very interesting at all, more like a wild goose chase that puts emphasis on the talents of the wheelchair bound genius Major Giles Roper. The pace seems very slow, unlike many other Sean Dillon based novels I've read, and over time, the characters don't seem very different. Yes, Dillon is brash, and Ferguson is uncaring, but it doesn't come out as easily as before. Even the US President seems to have gone nameless, and Clancy Smith seems more a stranger to the set of characters than usual. Another aspect that is repetitive is the Irish villain. Most of the novels have one Irish bad guy in them, and this is no different. I haven't read the novel where Hannah Bernstein is killed, but the novel misses her character badly. And the action scenes lack punch. I don't know what to make of this novel, from the perspective of a Sean Dillon fan. I can only hope it's a one-off glitch. I rate it 2 stars. Reviewed by: Vinay Leo R.
This is not a paid review. The opinions expressed are my own and unbiased.